Let's help make this amazing community even better by showing love and kindness to all those in need- not just this holiday season, but all year long! Here's a few places to donate toys, clothes, or time! The Shelby County Fire Department is collecting toys and money for their annual toy drive until December 15 at Fire Station 1. 100% of your donations go to helping children in Shelby County. There are also several Toys for Tots boxes set up around town to collect new toys for children in need. The Shelby County Library is having a Shoe Box Challenge. They are asking that you decoratea shoe box, fill it with personal hygiene items, and then drop it off at the library before December 17th. Boxes will be donated to the Serenity Center in Shelbyville. They are trying to reach their goal of 400 boxes- let's help them out! Examples of items to include in box include soap, toothbrush/paste, combs, shaving cream, razor, lotions, deodorant, etc. Big Brothers Big Sisters of Shelby County is accepting donations for the families in need that they serve. They are always looking for mentors and community leaders to serve on their advisory board. They have mentors waiting to be matched with youth ages 7-16. If you want to be a Big Brother or Big Sister call 753-3745 or visit bbbsky.org today! Help a child or family in need through the Angel Tree. There are several angel trees around the county that still have angels that need to be adopted. Kroger has a tree full of angels looking for food donations or gift cards. Call local churches to see if they still have angels or families in need of assistance. Do you knit or crochet? If so, A Place to Sleep, needs volunteers who can knit or crochet blocks for blankets. Free yarn and hooks/needles are available if needed. Contact Lynn Whittaker at 321-7116 if you can help out with this great ministry. Soles for Souls at Central Baptist Church, 1958 US 127 Bypass-North. They are collecting new and clean used footwear of various types to donate to people in the community and around the world that may need them. Crestview Care and Rehabilitation is looking for volunteers to help residents through arts, crafts, games, music, reading, and other activities. Crestview will also host small groups to include interested residents for community or religious involvement. Call Brittany Mitchell at 633-2454 to volunteer today! Therapeutic Riding Association Inc. of Louisville (T.R.A.I.L) is located in Simpsonville and is looking for individuals who enjoy horses and working with special needs children and adults to help assist with therapeutic riding lessons. Call Nathalie Green at 876-7844 if this sounds like something that you could assist with. You can donate your gently used items to Operation Care or Centro Latino on Main Street. Shelby County Animal Shelter is looking for volunteers to walk, play with, and socialize with dogs and cats. Call 633-0009 to volunteer today! Tyson's Chance Animal Foundation is always looking for donations of various items. Like them on Facebook to keep up with what they are in need of the most. An easy way to give back is to make sure your Kroger card is linked up to your local school, church, or nonprofit through their Community Rewards program. It's an easy way to raise money for your organization, just by shopping at Kroger and swiping your card! 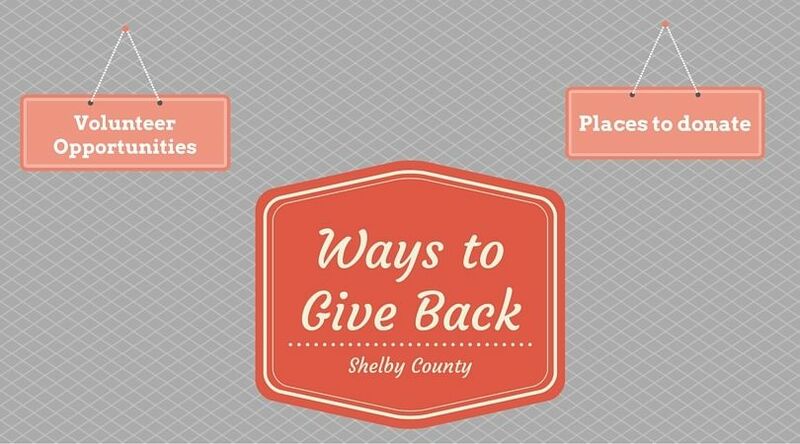 I'm sure there are many other great ways to give back in Shelby County. If you know of any that you would like to add to the list, please email me at Kimberly@louisvillefamilyfun.net and I will gladly add it! Thank you!